You guys know that my love affair with pasta goes way back. Like way, way, way back. Growing up in an Italian family (or at least, 50% Italian), pasta has always been a staple in our kitchen. When other kids were bringing peanut butter and jelly sandwiches to lunch at school, I was toting along a container of leftover buttered pasta with parmigiano-reggiano cheese. My family can attest to this. My love of pasta runs deep in my veins. So, you can imagine my initial reaction to the idea of vegetable noodles. Major side eye. As any true Italian would tell you, I was majorly skeptical. For that reason, and many others, I feel a level of kindred spirit with my girl Ali of Inspiralized. She, too, was skeptical at first, but quickly convinced once she had her first bite of perfectly twirlable zucchini noodles. The best part? 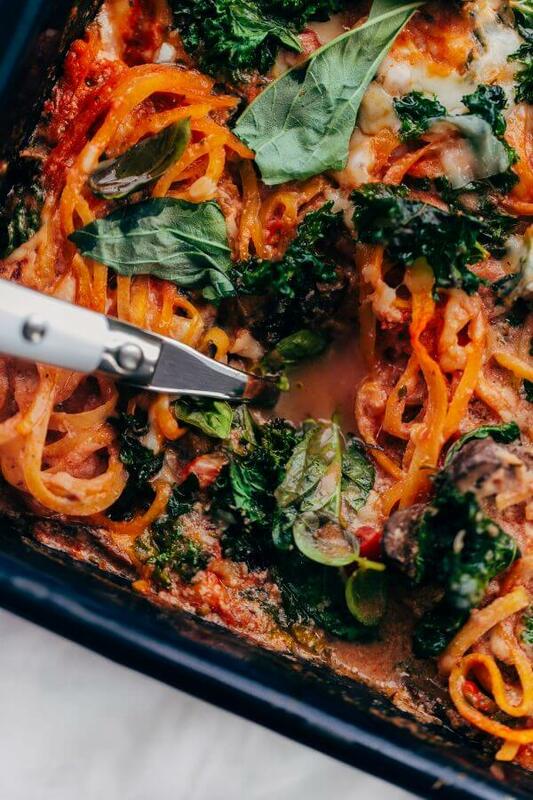 Ali took the concept of spiralized veggies and ran with it- quite literally – creating her very own inspiralizer tool and bringing everyone, including me, right along with her! I had the pleasure of meeting and rooming with Ali at a blogging retreat earlier this year. She’s a true trail-blazer and one of the hardest working, not to mention most positive and encouraging, bloggers that I’ve ever met. Today we’re celebrating the release of her newest cookbook, Inspiralize Everything, which came out earlier this week. As the name suggests, Ali’s latest cookbook is an apples-to-zucchini encyclopedia of spiralizing. It covers the basics and goes well beyond them. The recipes (there are 120 of them!) are incredibly creative, yet familiar and accessible. One of my favorite elements to this cookbook is that it is divided into chapters (twenty one of them!) dedicated to a specific vegetable and fruit. The chapter introductions provide a great overview of each vegetable, share preparation tips, nutritional information, and much more. Even better, most recipes are accompanied by substitution ideas, making them versatile and adaptable. One of the reasons why I fell in love with spiralizing this past year is that it encourages me to prepare and cook vegetables that I might have otherwise passed by at the store or at the farmer’s market. As a vegetable lover (or anyone looking to add more vegetables into their diet! ), this is particularly exciting and refreshing. Rutabaga is one of those vegetables that I, for whatever reason, just never think about or buy. 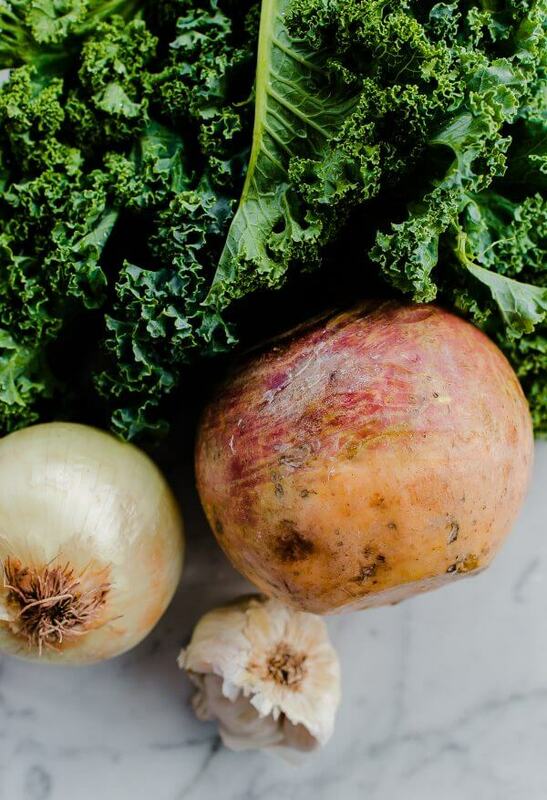 Raw rutabaga is similar in texture and flavor to a turnip (in fact, they look very similar too, so don’t confuse them at the store!). When cooked, it becomes much more delicate in flavor. 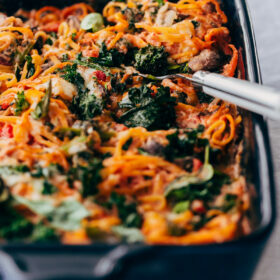 As Ali explains in the chapter introduction, rutabaga holds up extremely well to cooking, making it the perfect vegetable noodle of choice for this baked ziti with kale and mushrooms. This dish has all of my favorite Italian flavors: crushed tomatoes, oregano, rosemary, red pepper flakes, ricotta, mozzarella, and parmesan cheese. 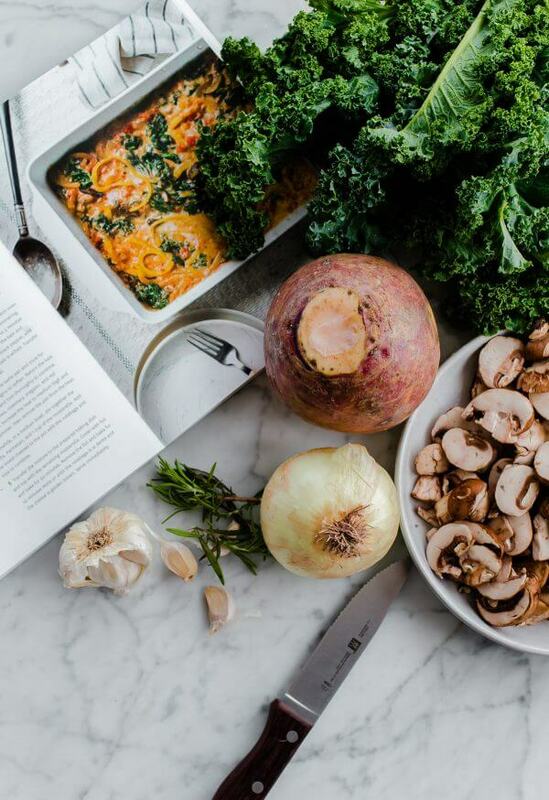 The mushrooms and kale add texture and heartiness. 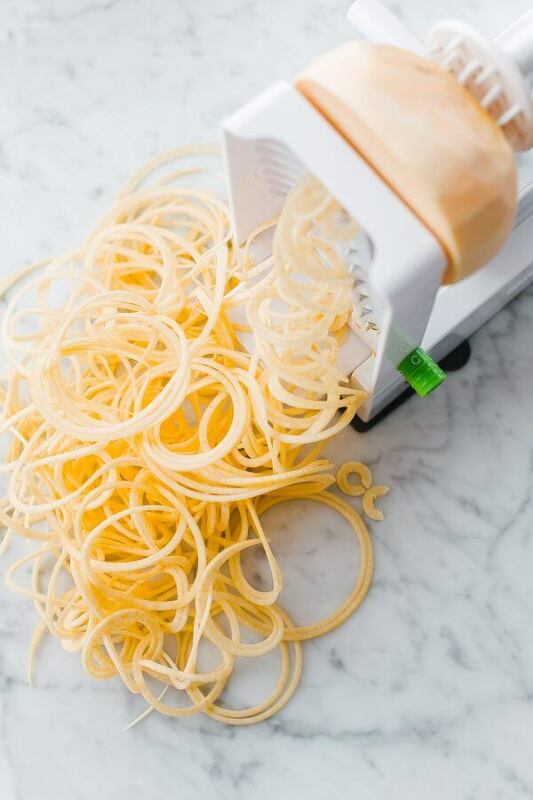 It is extremely important that you have a durable and high-quality spiralizer to make this recipe. Rutabagas are tough, tough vegetables. The type of vegetable that makes you worry about losing a finger if you were to traditionally slice and dice it (yes, tougher than winter squash). Thankfully, Ali created her very own inspiralizer to handle the job and it has become one of my favorite kitchen tools. It created beautiful rutabaga noodles with ease! Like, ridiculously easy. It’s also extremely fun, so if you have kids or want to involve other family members in the cooking process, spiralizing is the way to do it. Can’t find rutabaga? Ali suggests trying sweet potato or potato as a substitute in this recipe! This cookbook is a winner! Connor and I couldn’t get over how filling and satisfying this was! Like, so satisfying that I didn’t even need to get seconds (and I never say or do that). Preheat the oven to 400 degrees Fahrenheit. Coat a medium baking dish with cooking spray. Heat the olive oil in a large pot or Dutch oven over medium-high heat. When the oil is shimmering, add the garlic and onion and cook for 3 to 5 minutes or until the oven is translucent. Add the kale and mushrooms, season with salt and black pepper, and cook for 5 minutes or until the kale is wilted. Transfer the mixture to a medium bowl. Add the rutabaga to the same pan and cook for 5 minutes or until it begins to soften (*I added a tablespoon or two of water during this step). Return the kale mixture to the pan and toss thoroughly to combine. Stir in the tomatoes, rosemary, oregano, and red pepper flakes. Increase the heat to medium-high and bring to a simmer, then remove the pan from the heat. Meanwhile, in a medium bowl, stir together the ricotta, Parmesan, and 1 cup of the mozzarella. Add the mixed cheeses to the pot with the rutabaga and toss to combine. Transfer the mixture to the prepared baking dish and top with the remaining mozzarella. Cover with foil and bake for 20 minutes. Remove the foil and bake for 10 minutes more or until the rutabaga is al dente and the cheese is golden brown. Serve immediately. This dish is extremely hearty and filling as is. 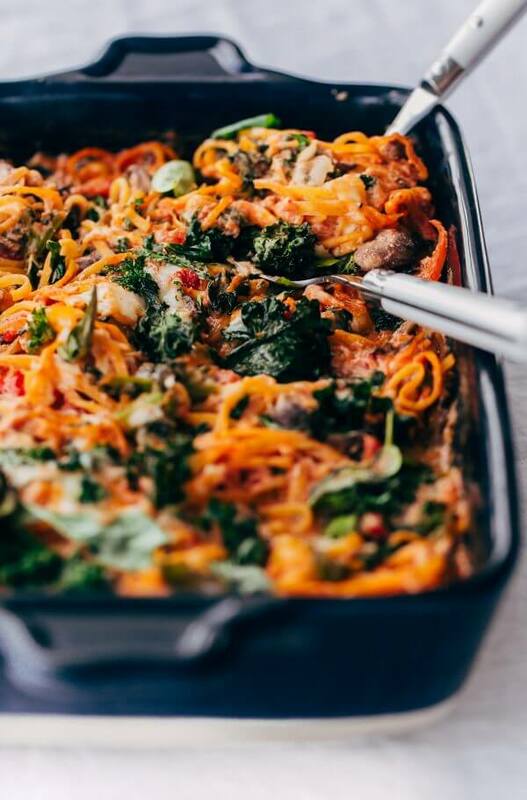 If you’re a meat lover, Ali suggests adding crumbled sausage or ground turkey (this should be cooked separately and added before transferring the mixture to the baking dish) to bulk this dish with extra flavor and protein. Feel free to substitute rutabaga with sweet potato (1 large or 2 medium peeled sweet potatoes will be equivalent in size)!